Sending "get well" wishes just got a whole lot easier with this clever new collection of stamps and dies! Whether you know someone who's recovering from a serious illness, has come down with a common cold or is just plain overworked and deserves a rest, we think you'll love using these new products to send a little love their way. Take It Easy is a scene building set for all your adult get well cards, because when you are feeling down and out, indulging in a pajama day is sometimes exactly what the doctor ordered. An assortment of sentiments cover a wide range of occasions from get well, Mother's Day, encouragement, and humor. For an additional fun detail, the headlines that can be stamped on the folded newspaper prove that laughter is always the best medicine. Take It Easy will be available for purchase on December 15th. Take It Easy contains a total of 27 images. The pillow measures 2" x 1-1/4". The pajama bottoms measure 1" x 2 -⅛ ". The pajama top measures 1"x 1-1/4". The "those who dream" sentiment measures 2-1/8" x 1/2". 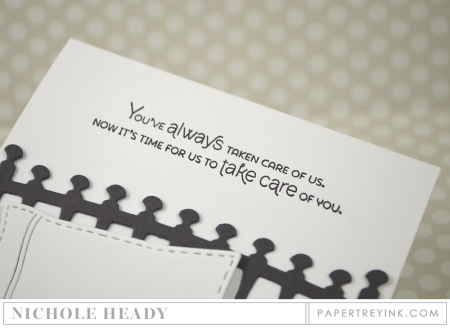 The "you've always taken care of us…" sentiment measures 2-3/4" x 1/2". 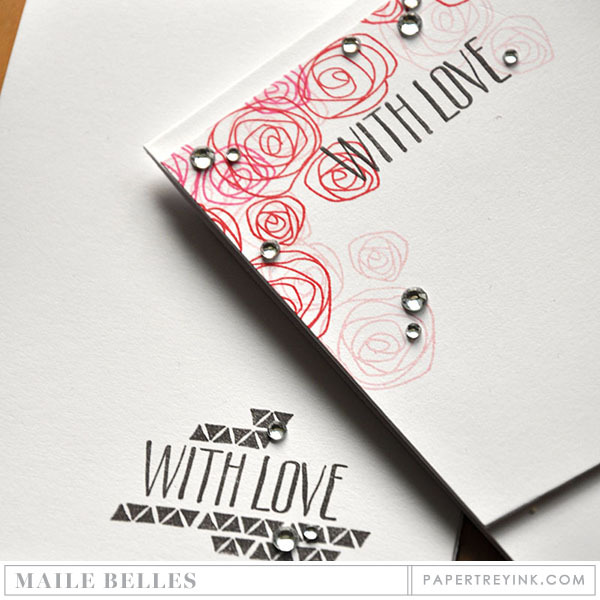 A coordinating die collection will be available for sale separately, retailing for $12. This collection includes a total of 9 dies. Pillows: 1 1/4" x 2 1/4", Tray: 1 1/8" x 1 11/16", PJ Shirt: 1 7/16" x 1 1/8", Hot Water Bottle: 1 1/16 x 5/8", Glasses: 5/16" x 5/8", Tissue Box: 9/16" x 15/16", PJ Pants: 2 1/4" x 1 3/16", Tissue: 7/16" x 7/16", Newspaper: 1 1/8" x 1 3/8". Keep It Simple: Sending Hugs is the fortieth in a series of stamp sets allowing you to build a collection of basic, medium-sized sentiments, in a nice variety of fonts, that you can turn to again and again. With this edition we are focusing on "sending hugs", the perfect thing to send for encouragement, get well wishes or just thinking of you! Keep It Simple: Sending Hugs will be available for purchase on December 15th. Keep It Simple: Sending Hugs contains a total of 7 images. All of sentiments average between 2-1/4" and 2-3/8" long. They average between 1/8" and 3/8" tall. Just the thing to pair up with the Take It Easy stamp set! Complete with headboard, a fluffy pillow and lots of cozy blankets! Cozy Bed die collection will be available for purchase on December 15th. It will retail for $21. 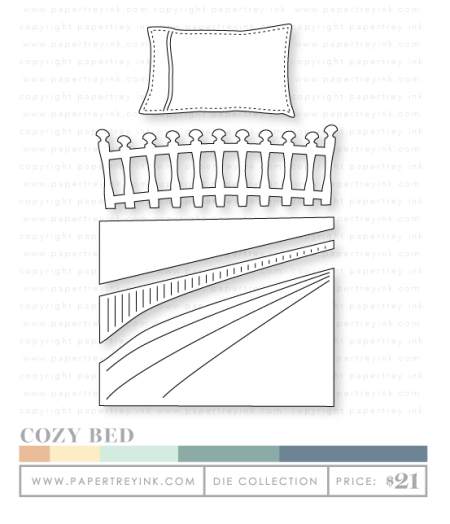 Cozy Bed die collection contains a total of 5 dies. Pillows: 1 5/8" x 2 11/16", Headboard: 1 3/8" x 4 1/8", Top of Bed: 1 1/8" x 4", Middle of Bed: 13/16" x 4", Bottom of Bed: 2 3/8" x 4". Now you can make a quick and easy cover for those little packages of tissues, great for when putting together a little get well soon care package. With just two cuts, you can customize the tissues for your recipient. 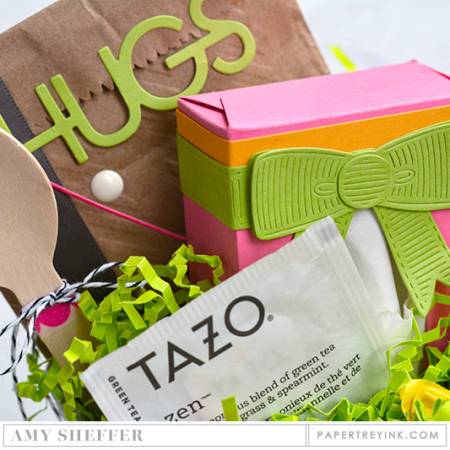 Not to mention, you can also create a plain box without the oval opening for everyday gift/treat packaging! Tissue Box Cover die collection will be available for purchase on December 15th. 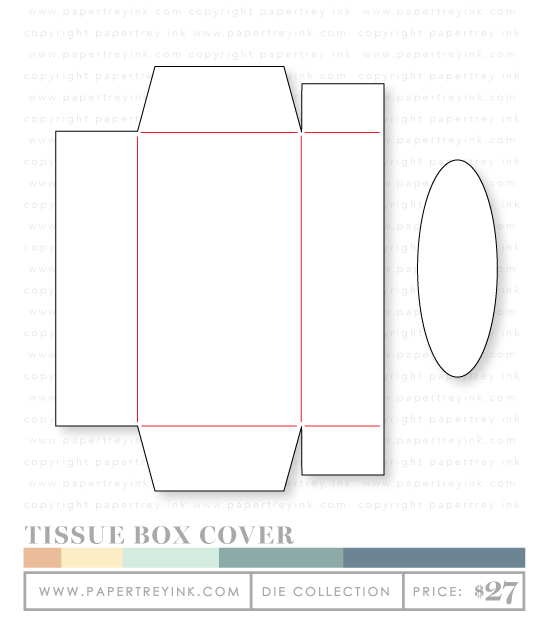 Tissue Box Cover die collection contains a total of 2 dies. Box: 5" x 6 1/2", Oval: 1 1/4" x 3 1/4", assembled box measures 4-1/2" wide x 2-1/2" deep x 1-14" tall. 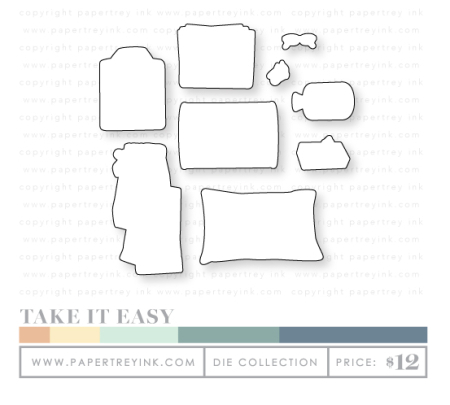 I am just LOVING the new Take It Easy set along with the Cozy Bed dies. They are AMAZING and I see so many possibilities with them! I decided to do something a bit different and add a few basic lines to the bedspread portion of the Cozy Bed dies to make a quilt. This was so fun and easy to do too! I used a black pen to add some basic lines and then went back in and colored the various squares with Copic markers. Once the coloring was completed, I added some stitching with a white gel pen. This sentiment from Take It Easy is one of my favorites, it is such a thoughtful thing to say, and I know it holds true with many people that I know. Especially some of my best girlfriends. The Cozy Bed dies are the perfect size to add a sentiment either below or above, and as you can see I added my above here. This newspaper from the Take It Easy set is just so clever, Erin does it every time! The newspaper image actually has a large blank spot on the cover, and she included lots of fun headlines that you can add in, depending on your recipient. It is just another detail that allows you to customize your projects and make someone feel extra special and loved. Now that you have seen a project from me, here are some of the amazing things that the team has created! Amy says, "Erin’s get well products are so clever and fun! I couldn’t help but chuckle over the funny newspaper headlines in Take It Easy, and the Cozy Bed dies are so wonderfully unique. Stop by to see how I’ve pulled everything together to make a care package that’s big on heart, but doesn’t break the bank!" Ashley says, "What better way to uplift someone's spirits during a time of triumph or recovery, than a handmade card and gift. 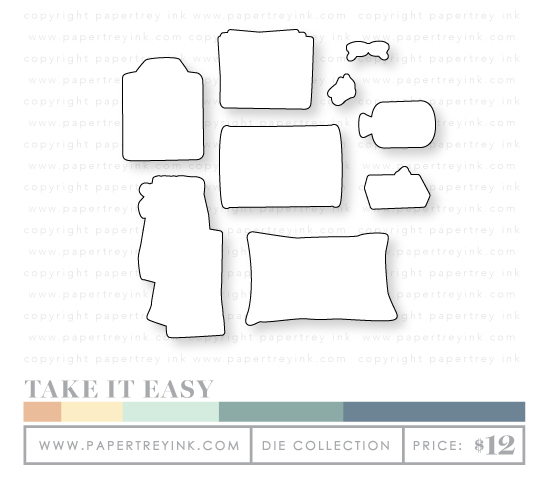 Take It Easy is a lovely new stamp set full of comforting illustrations and sentiments. The new tissue box die is super cute and very easy to assemble, yet is so purposeful during times of illness. Check out a quick and easy gift ensemble I've prepared for the sick and shut in." Betsy says, "What a wonderful collection of products Erin has designed for us, making it fun to create cards and gifts for loved ones that are a bit under the weather! I found that many of the accessories in the Take it Easy set are sized perfectly for the Dress Up Dolls, who are also the perfect size to snuggle up in the Cozy Bed die! 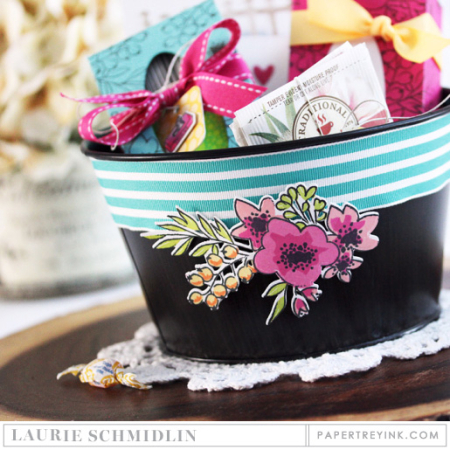 I pulled out the oldie but goodie Strawberry Patch set to create a cheerful berry-themed get well basket – I hope you'll stop by to check it out!" Dawn says, "Creating "Get Well" type cards just got a whole lot more fun, thanks to this new collection of stamps and dies! I had so much fun creating custom bedsheets for the bed on my card, using stamps and the new Cozy Bed dies! I love that you can stamp bedsheets for any age and gender, with a ton of different stamps you probably already have in your collection! Pop over to my blog to check out my card and my little get well gift set, too." Heather says, "It's no fun when you or a loved one get sick, but it is nice to get a little sunshine when you are under the weather. A card is nice, but why not amp it up a bit with a gift basket that includes a few things that will pamper the recipient and help them on their way to recovery." Kay says, "Unfortunately this is the time of year when bugs are rampant and you really need lots of get well cards. Erin has some really cute new products that will make creating projects for these occasions fun, and will definitely bring a smile to the face of the recipient! Come see the whimsical projects I created with the adorable Cozy Bed die and fabulous extras!" Laurie Schmidlin says, "The products being highlighted today are a perfect combination of creative innovation, whimsical encouragement, and classic versatility! It's amazing to me what a small gift and uplifting card can do for someone who isn't feeling well! Letting someone know that they are cared (especially during an illness or injury), to me is the embodiment of kindness!" Laurie Willison says, "Receiving a get well note or gift, is always an encouraging pick me up. Today we are showcasing some new stamps and dies that are sure to help make that gift extra special. I have an ensemble of things to share, especially for mom!" Lizzie says, "It's never fun to be sick, but a care package can make even the ickiest days a little bit brighter. Erin has designed a whole collection of products that will make it a breeze to deliver a ray of sunshine to your laid-up loved ones. Stop by to see the gift basket full of my favorite sick day staples and the adorable coordinating accessories I created to make it even more special." Melissa says, "Helping someone feel better through paper-crafting is such a healing thing to do for someone special and for yourself as well. As I sat down to create this gift ensemble for someone who had the Winter Blues, I found myself feeling so grateful for card-making and paper-crafting in my life and thankful for the joy it brings me. 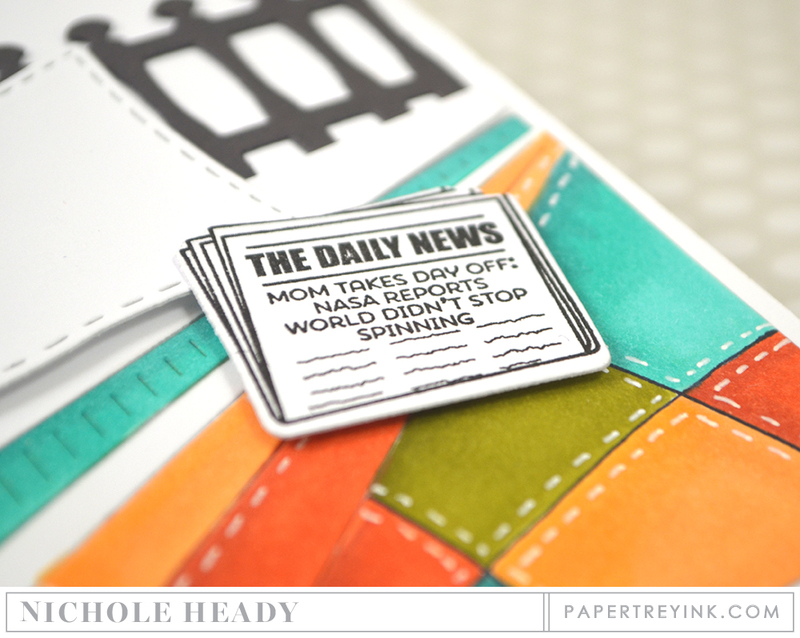 The new Take it Easy stamp set and dies and coordinating "Feel Better" products make the creating even more enjoyable." I hope you have enjoyed all these amazing creations that both the team and I have shared with you today! Do you know someone you could make a card for right now, using these new products? Can you see yourself putting these to good use? We would love to hear your initial thoughts on everything we introduced! Please leave a comment on this post to tell us what you think of the new products and you will be eligible to win big! You have until 7am ET, December 14th to leave your comment and be eligible to win. Only one comment per person please. One randomly selected winner will be announced on our December Release Winners Page before noon ET the same day. Thank you for stopping by today and best of luck with the contest! What an uplifting set of products! They would definitely cheer anyone under the weather! Still liking Fresh Bouquet a lot! Very cute! I can see this as being a lot of fun to play with! Love the Cozy Bed! Awesome new items! Everyone’s projects this morning were so much fun! Loving Cozy Bed! Very clever dies and stamps which will come in handy during the flu season I am sure!! Oh my! These new sets and dies are AMAZING! I love them all!!! Love the bed dies and adorable stamps too! 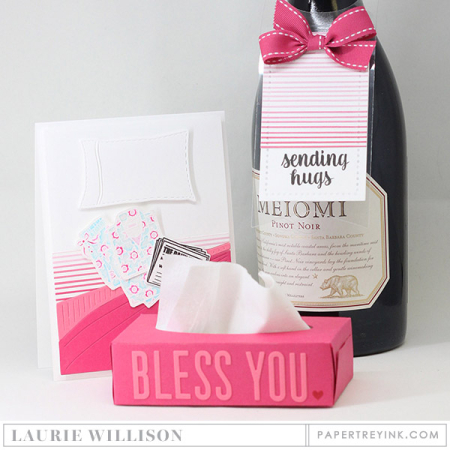 The Tissue Box die is fabulous-love it! So much inspiration, great job ladies! What a great way to make someone not feeling well ?. Such a sweet assortment of “feel better” supplies! I love the adorable bedding and pajamas, and the tissue box cover is so genius. Loving all the fantastic design team samples! With flu season upon us, these sets are certainly timely! And who wouldn’t love to get a pretty card or decorated kleenex box when you are not feeling well! I can see lots of uses for that kleenex box, tears of joy, sorrow, laughter with friends! You had me at quilt…and then I saw the hot water bottle. This release is going to cost me! Very cute set – Erin thinks of everything! Such a cute set!! With every little detail included!! A great way to make a fun little package for someone. I love the tissue box! The whole set is super cute. That tissue box cover looks super fun!! Love all of the sample projects from the team!!! It’s all so cute. Love the tissue box cover die and the way some of the box samples are decorated. A great concept for stamps and dies to create wonderful get well wishes. I love the tissue box die and everyone’s projects with it. Nicole, your quilt looks so comfortable. Love the tissue box die! The newspaper die and stamp also so cute. What a fun concept for get well wishes! I love the tissue box die, very adorable. There is always so much to love at PTI! I love these new products!!!! I make a lot of get well cards and these products are so lovely! The gift ensembles that many of the creative team members made are standouts! Such beautiful projects today! I love the idea of sending get well cards – looks like a great set to build up a stash of cute ones! The tissue box cover is so cute and I love the headlines! Those jammies are SO CUTE! I love the bed tray accessories too, always wanted a romantc breakfast carried to me in bed, or when I was sick or recovering from surgery even… Some GREAT supplies here for some FABULOUS get well soon cards! This is wonderful!!! So much goodness! I really like the tissue box cover…what a great idea! This is such a cute release. I love all the sentiments about being in love. Wonderful cards designs! Adorable projects and amazing products! Terrific get well ideas abound! Perfect stamps and dies for get well wishes, love it all! Great ideas! Great projects! Love that patchwork quilt! Everything today coordinates so well together! (you guys did this on purpose didn’t you so we couldn’t resist buying it all-right?!) Loved the samples the DT came up with today…so cute! Adorable and uplifting set of products for sending get will wishes – especially love the tissue box! Love the tissue box die!! OK, I will take 1 of everything! I love everything showcased today! And I actually thought that I would get to save some money this month! Silly me! LOL! What a unique idea for a stamp set! I am so excited about this new release!!! Your releases just keep getting better and better!! Wonderful inspiration and new products!!! I love the pillow, pajamas and hot water bottle! All the girls in our family have a hot water bottle that looks just like that one! Great set! Love the Cozy Bed stamps and the tissue box. So cute! Wow!! Just amazing and creative new products and ideas! Love all the new releases. What an uplifting post with all of these adorable ensembles! Erin thought of everything with these stamps and dies. Eager to see more of the newspaper headlines. Everything is so cute! Nichole, your bed quilt looks so realistic. Oh no! Now I need a tissue box….duh. This is a precious set of stamps and dies. What a nice suite of products. I especially like the tissue box. Can think of hundreds of things to do with it. Thanks for all the inspiration! Such fun and unique products! Love the Take it Easy set! Very cute. I love that tissue box! Once again PTI’s ingenuity astounds me! Love the new Cozy Bed dies! How do you make an a bed look so realistic? love the Newspaper and sentiment and am anxious to see the remainder of the images in Take it Easy. LOVE, LOVE, LOVE these new products! This is a nice addition to your product line. Great ideas! I’m loving the “Get Well” theme. Such cute new products!! Very cute. These will make great get well cards. Some of those Get Well sentiments are the best I’ve ever seen. Great job! Wow! Did this day completely catch me by surprise. Beautifully done, ladies. Nichole, your colorful quilt sold me the set! All so special and different! Lots of inspiration this morning! All the DT projects are lovely today! These new products are so unique too. Oh, you’ve done it again. Every month there is at least one product that causes me to think, “well, that’s nice, but I would have no use for it.” After seeing all the adorable uses for the Feel Better products, I’ve changed my mind! Now I find myself wondering who I know that would love a thoughtful little basket like the samples today. It would be nice to keep a few on hand. Love the tissue box. LOVE these new goodies, I am sending more Get Well, Hugs and encouragement type cards and looking for something different and fun: this is it! I love all the little gift baskets, cards and tags and that tissue box too, all would put an instant smile on the recipient’s face. Fun way to wish someone well. How cute and clever to have thought of a set like this! I love it! Eeeek! The bed and tissue related items are pure genius! What a great concept. So cute! What great products to help the loved ones in our lives feel just a little better when they’re not feeling good at all. Such a great idea Erin! Love all the cute details! Wow, such detail in these sets. Very clever. Fabulous projects! So excited for this release! So cute! Love the new tissue box die. Oh my goodness….I love these. The tissue box is soon cute!! How much fun it would be to put this all together. Super cute images!! Loving the little paper with headlines!! So creative! Another fun release PTI! Love these ideas, and these new set and dies. What a great concept! These are must have stamps and dies! How cheery and clever and would brighten anyone’s day! I especially love the cute little tissue box. I also like that it can be used in different ways. Always love the versatility! Each day the inspiration gets better and better. What a great way to bring encouragement during times of illness. Love all the new products! I love the little tissue box!!! Love the tissue box cover! What a fun way to cheer up an invalid! Oh wow, being able to personalized tissue paper box just fun, I have a guest room and often have friends over from overseas, I like to make the room and bathroom like it was specially made for them, this is sure a good thing to have! These new sets are truly amazing! Beautiful projects! So many cute ideas today!! I’m sunshine lady for our quilt guild. I’m loving the quilt die! What a wonderful card to send ill guild members! Oh this is too cute! Love the bed, all the little dies, the tissue box! and the great DT inspiration! What a thoughtful and clever way to bring a smile to someone’s face when they are not feeling their best! Absolutely love these!!! The cosy bed set is amazing!!!!! I love it!! Oh I just love the pj’s and pillow box. How cute and would be fun to use. Love the bed!The tissue cover will be fun. What fun sets for this month! Very unique products! And we always need a stash of get well cards! Wonderful products for get well cards. I make a fair amount of them. Love everything in today’s release. That tissue box is great. The tissue box cover is just the cutest. Got to have that one. A cad made with these stamps and dies would be very heartwarming, and a keeper! Love everything in today’s release. The tissue box is a great idea. Wonderful get well inspirations! Especially love the tissue boxes!!! I am LOVING that tissue box!!!! Such a great idea. I think these products are awesome! Everybody did such a great job! You think outside the box on EVERYTHING!! I love this set so much~thank you for the gorgeous inspiration too! That tissue box die is pure genius. I love everything from today!! I need all of it! Lovely projects! Another great release! Liking the fresh bouquet more and more. This is such an Awesome set!! I can see so many ways to use the dies and stamps. Love it! The DT did an Amazing job of showing different ways to use them. Thanks for the chance to win. I love the gift sets created today! Love this new bed set. And the pajamas. Great inspiration and design! This is a genius set of stamps and dies. Adorable! THese are products that are practical and very pretty. I can see myself getting a lot of use from them. I’ve no immediate need for these products, but for those who make get well cards often they will be very useful. Oh my goodness….. all of these products today look SO useful and so very versatile! Especially that little box…. I can see all sorts of uses for it. LOVE. The tissue box cover was a surprise. How cute. So many wonderful samples ladies! Amazing release! These new sets are fantastic! I love all the detail in the cozy bed die set and the tissue cover is really adorable. And I can hardly wait to see all of the stamps in this new set. It’s so great to have something to cheer someone up who’s feeling under the weather. These are definitely going on my must have list. OMG!!!! I’m definitely in love for the great versatility of these new products!!! Beautiful cards and projects!!!! I have been recovering from an injury over the last month; I would have loved to receive some of these amazing get well ideas! 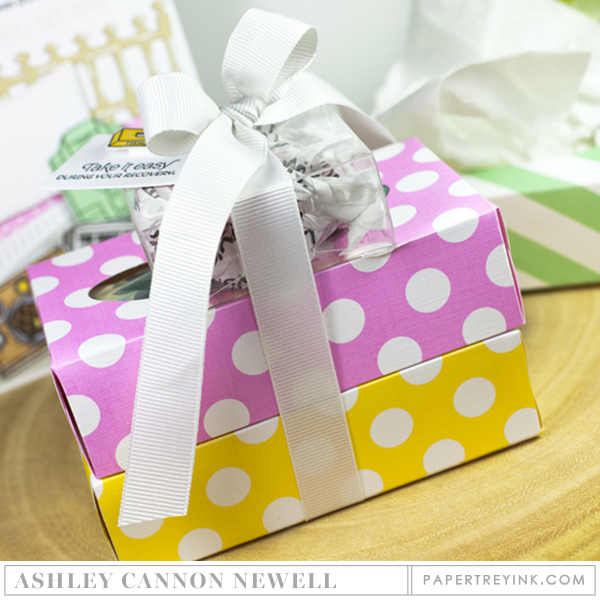 I love the tissue box die and Nichole’s quilt! I just love your unique products and fabulous inspiration projects! That Cozy Bed die set is brilliant! I love the beautiful quilt you created for your sample card too. Love what you did with the bed! And love the tissue box die! Awe! I love these sets!! I am sick right now and would love a card sent to me with the pillow and blanket!! Everything is so cute today! I love all the tissue box covers! This includes several sentiments that would work for those with long term illnesses which I appreciate and would use. Great selection in this release! 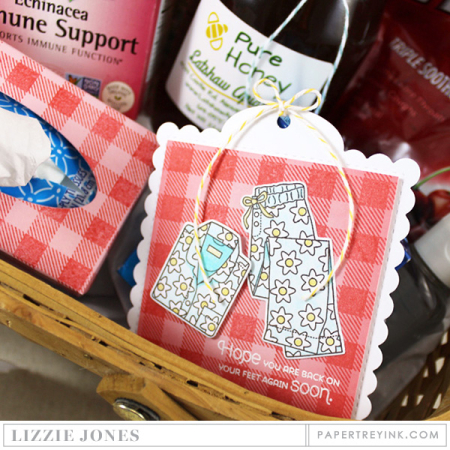 Such great products for those get well cards! Love all the adorable get well gifts! Lots of cute products today and great projects by the design team! Wow – Erin really has thought of everything with these products – cosy bedding, PJs, tissues, and brilliant funny headlines. Can’t wait to play with these goodies! I love the tissue box cover! So clever! Love dies like the tissue box cover die that can not only be made to match project, but are also functional. Thank you! I can imagine all the different cards that can be created with this set and love that a tissue holder die was created! That bouquet set is just gorgeous with all the different colors! Great new products! What wonderful gifts you could make! Love this! Really could use this set many times over! What an adorable set! That bed is so cute. These gift ideas are awesome! So thoughtful and pretty!! Such a creative idea with the bed! Very clever and cute. Darling “get well” items today. Loved how Nicole changed that blanket into a quilt. The little gift baskets were an inspiration, such a thoughtful thing to do. Thanks for all the ideas. What a great addition to your fabulous line of stamps and dies. A much needed assortment of caring stamps, etc. Another exciting release. Love, love the Take it Easy set. Soooo cute and the design team did a great job. Some great ideas to lift spirits, whether the recipient is ill or exhausted or feeling down. Thanks! Very clever group of products to cheer up those under the weather! A tissue box cover…who would have thought!!! PTI, of course!!! Love the faux quilt on the bed! Love, love, love these new stamps and dies. So adorable and so needed. The sentiments are so perfect. What a great idea for someone not feeling well or for after a medical procedure. I especially like that the tissue box die can be used for gift giving too. Flu season is upon us! These sets will fit the bill. What a great idea for someone not feeling well or that has a scheduled medical procedure. I especially like that the tissue box die can be used for gift giving! what a great release! Anyone would feel so comforted to receive any of these projects for get well wishes. Unfortunately, I am sending out more “get well” cards these days. Nice to have a different set of stamps to use for these cards. Thanks! Oh the bed and accessories are really cute. Great ideas for get well cards!! Lots of cute new products today. Especially love the tissue box! They are all so cute! Would love to make some myself …the 15 TH is just coming up! this is so fun and the projects are so creative! You guys are so clever! I love these products! 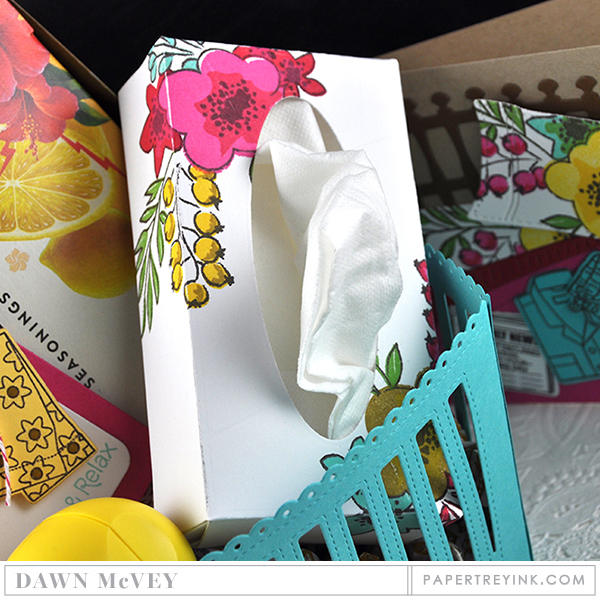 Love the Take it Easy set and the tissue box is a great gift for someone that isn’t feeling well. Oh my! The mini tissue box is too cute!! What lovely new products today! I’m thrilled to see the new products for making get well wishes. Unique and fun…to make and to receive! Erin has done it again with this set of products that are over the top adorable. I know I will enjoy making these get well kits as much as the recipients will receiving them! Oh what sweet sets and fun ideas. It would be great to have some pre made gifts to give when needed. Wow how adorable is that little tissue box holder! What fun and clever products PTI! Love all the design teams creations! So much inspiration. Some great new stamps and dies. This release looks amazing. Cute idea and lots of options! So much creativity! I especially love the tissue box. All the little extras are sure to brighten everyone’s day! Especially love the kleenex cover. The tissue box cover is genius!!! I LOVE this! Love that tissue box cover! How clever are you turning the bedspread into a quilt! I have seen get well products before but these items are a notch above the rest! They look like tons of fun to create with! Everything is do darn cute! Such a great idea! These are absolutely adorable! I can’t get over the wonderful projects the gals made with them. Wonder new get well inspiration. Love the quilt and pillow. OMG – the get well sets are SO cute. Great projects, as always! Saw Kay’s post before seeing this blog, and wondered who had made such an innovative set, other than Papertrey. Of course, it IS you folks. Pure genius. Love these! So unique and perfect to cheer up someone under the weather. Love these, get well things always seem so hard, not these! Lovely!! Makes the one under the weather put on a smile knowing someone cares. Nice inspirations!!! Wow! Another really unique line of products. All the bed creations from the team were fun to see and Erin newspaper headline did make me laugh out loud! How cute! I love those bedpost, pillow and blanket dies. Great projects for this fun new line! Everything is so well thought out for this entire collection! Well done! Cute,cute,cute! That little tissue box is adorable! Love all the design team projects, sure to make anyone feel better fast. Oh my goodness – cuteness OVERLOAD!!!! Love it all today. And yesterday. Oh, and the day before that too. What am I going to do????? Love the Cozy Bed and Take It Easy dies and stamps. Super, super cute! What great cards. They would definely put a smile on anyone’s face when they are sick. I am totally blown away today. Wow! Just amazing products and projects by everyone! Now these are cool! I love what everyone did with it. So useful! This is a very cute set. I would have love to have those sayings in this set when my mother was living, because that is what I would always say to her. The tissue box die is awesome and really loving all the other “get well soon” products. Lots of fun stamps and dies!!!! 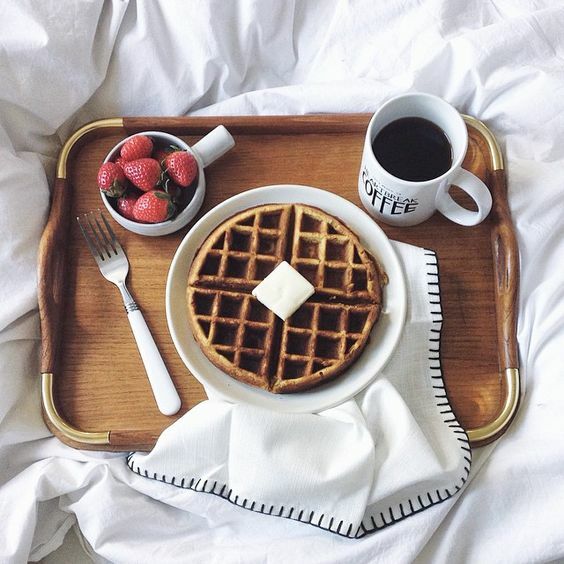 Love the little waffles!! Thanks for the chance to win! I could really use a Get Well set…love this one! That cozy bed is so amazing! I love the uniqueness of it! Fantastic and beautiful products! Love all the inspirational projects too! 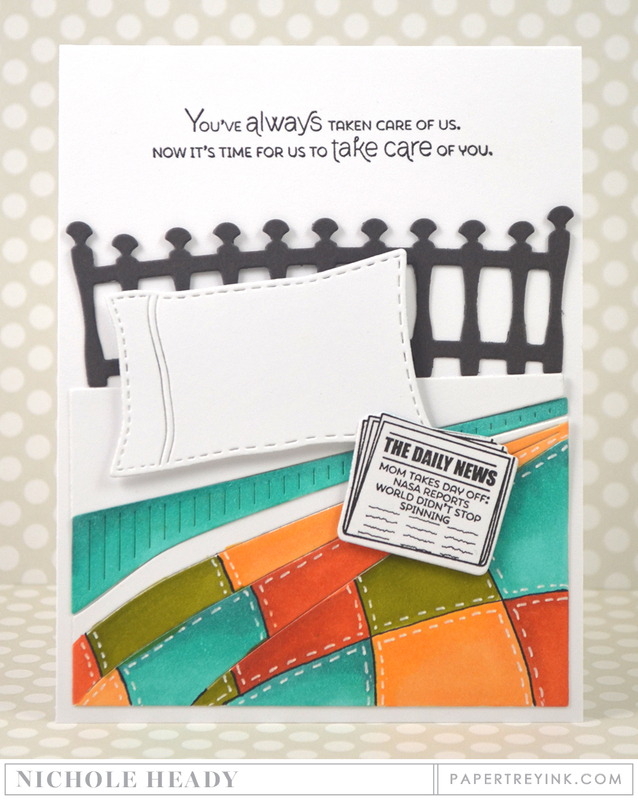 Love these cozy bed items for get well or just hello cards. Great ideas! What a wonderful line up. 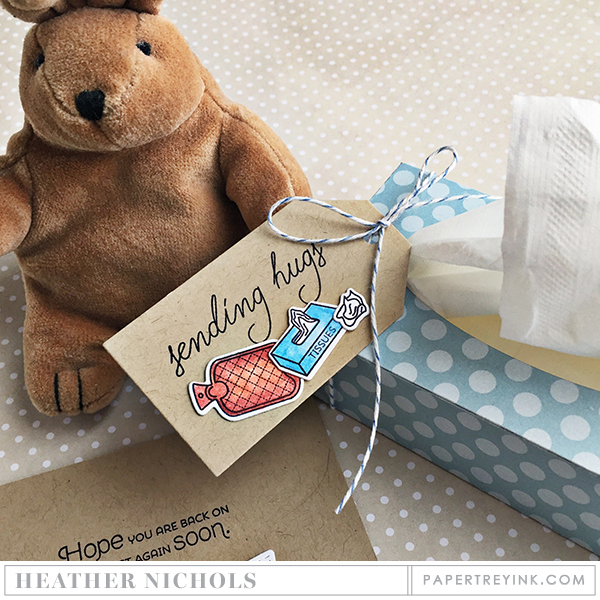 Love the Sending Hugs sentiment and the tissue box cover is definitely on my wish list. As I’m in the throes of a cold – this set is adorable! Thanks for the opportunity! These sets are the cleverest yet. Love love love them. What a sweet bunch of projects for someone who’s not feeling well. These stamps and dies make awesome cards. I especially love the newspaper stamp and the sheets die. Thanks for all the inspiration! One word for today’s release….adorable. Take it Easy is so creative and who can’t love the tissue box die and all it’s possibilities. What fun new products and fabulous inspiration! PTI designers are the best. Just love the Cozy in Bed set. How original! What a cute idea! I love the tissue box cover! OMG These will make the cutest get well cards. what fun new products today! Totally cute – everything you need to send well wishes to some. oh my! what cuteness today! perfect for get well cards and just relax and take care of yourself cards! I LOVE this set! The little newspaper is fabulous and I love the bed die cuts. The DT did a wonderful job like always! The cozy bed is a clever set to make!! This is such a clever line of products. Wonderful line up! as usual can’t wait to get my hands on that tissue box!! While Take It Easy and its accessories are a fun idea, they are not something that I see myself using. But KIS:Sending Hugs would be inked quite often. Take It Easy and Cozy Bed just go together so well! What fun get well/feel better projects today with these new dies and stamps. 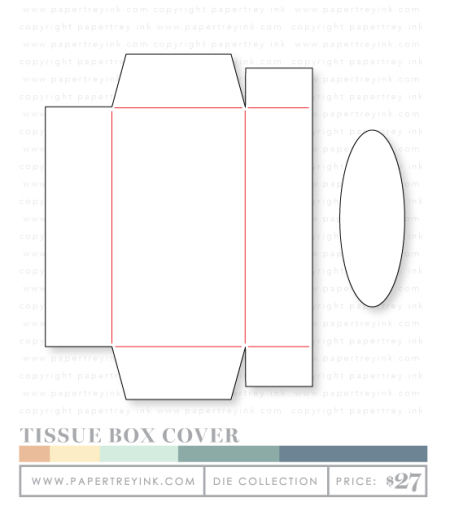 I love all the new items for the upcoming sniffel season, but the tissue box cover die really blows me away. What a cute set. I’m guessing receiving anything made from it would instantly lift someone’s spirits! I could see so many uses for that tissue box die. “junk in the trunk” minute to win it games for birthday parties and class parties, just an overall great concept. I love these products and ideas for Get Well/Feel Better cards. Just about anyone receiveing something made with these would feel better! These are the kind of cards I don’t make often…maybe because not many of my sets work for it. Nice to see these. Cozy bed is so, so cute. I love the all the new products! Gracious, that little tissue box is adorable! Your quilty bed is the cutest ever! Love that design! What fun sets of dies and stamps, so clever and charming! Fabulous new get well products! Love them all! Love th cut new products. Tha bd is too much! LOL! That Take it Easy set is adorable, and I just love the bedding options & that newspaper!!! And that tissue box! Amazing!!! Omg! I LOVE all the get well ideas, so adorable!!! Such cute sets. It’s good to have a supply of get-well cards available in the winter! How cute is that bed!!!!! Sooo cute! It sure would make me feel better to receive any of those cards…sooo cute!!!! Great theme! Terrific products and such great inspiration from the team. What a cool, fun, thoughtful collection! Love the look of the tissue box too! Just in time for my “I don’t get sick so I don’t need a flue shot!” friends. The DT gals are amazing artists. Fabulous projects by the whole design team!!! There’s nothing like your own specially designed tissue box! I’ve found get well to be one of the themes with the fewest image stamps and the most sentiments. I’m so excited to finally get some images that can work for any one regardless of age or gender!! Super cute sets and dies!! Thinking of others for me is at the heart of card giving. I really love the new get well stamps! Such cute cute dies!!!!! So fun! Love the new set. So many possibilities. Cozy Bed, so clever … what will PTI think of next?! Today’s products are so useful and a great way to spread kindness and cheer especially during the cold dreary winter months. And the tissue box!!! Great examples! I love this whole release. My wish list is sooo long!! What a wonderful release. So many truly fabulous ideas. I love the tissue box cover. I so love the dress up dolls with the take it easy set. That little tissue box is so cute! Today’s products are so sweet and would certainly cheer me up if I was ill! What cute and unique products for get well wishes. It’s amazing what you can create with those cozy bed dies. Love all of the great inspiration from today’s post! Love the cozy bed and the take it easy set! So many cute things this release!!!! Paper Clippings: Love Story is really something to love!! How fun, my favorite is the pajamas and little hot water bottle. These sets would make anyone not feeling well very happy. The tissue box cover is such a fantastic idea!! Now they can coordinate with anything! Love this release and the projects! Oh wow, these are such adorable goodies for get well cards!!! Oh wow! That bed die is amazing! How creative! The bed and pj’s are the cutest ever! I loved everyone’s projects today!! Love the Cozy Bed dies! Winter is certainly the time when we need get well cards or even thoughts of being cozy and warm in pjs. Oops, Ashley’s creations are shown under Betsy’s name! I clicked on her picture to the left instead. Nice cards, Thanks! What a cute stamp set & dies! I do send encouragement/ get well cards, & would love to own these!!! OH, I love these new images and dies… the tissue box is awesome! I also love the cozy bed pieces. Neat ideas! Fun innovations and cool inspiration! These are great! Perfect encouragement for those who are sick. That bed! And that tissue box! So adorable! Love it!The detail on the dies &stamps is incredible. This is great! I really don’t have much in the Get Well stamp selection. I can see a lot of use for this set especially. Very cute set to use to cheer up someone feeling under the weather. Cute projects. Thank you, PTI designers! Wow….these have to be the cutest stamps ever, just love those pj’s! I LOVE the tissue box!! More fabulous ideas from the PTI team. The cozy bed and tissue box covers are awesome! Everybody is going to be getting Get Well cards and mini-gifts from me. I adore that cozy bed and the tissue box is awesome. Fun feel better products. These would brighten up anybody’s mood and get them on the road to recovery. I really like the new stamps and dies to make get well cards. I like the fact that you could use these for guys too by just using different colors. What great ideas. Oh my gosh! I am in love! The samples today are fabulous! Genius bed dies! Fabulous tissue box cover!! And I LOVE that newspaper headline!!!! Very clever ingredients to send care packages! You have thought of everything … a lovely way to brighten someone’s day. Thank you for inspiring us, PTI DT. Lovely projects and sweet products. Loved all the colors the designers used. 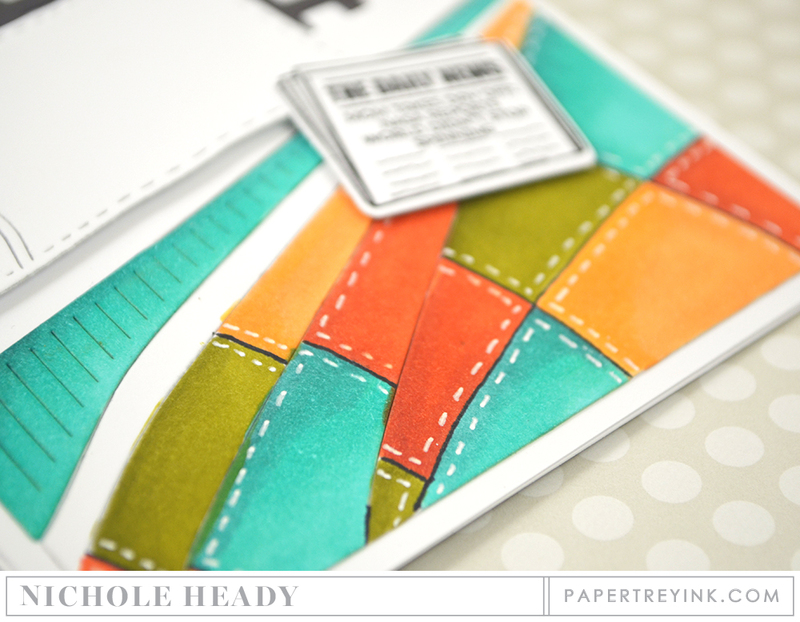 Dear Santa, Anything from Papertrey Ink’s December release would be wonderful! I love the Kleenex box! These are great products to uplift the spirit. What fun sets! I really love the Cozy Bed dies and the pajama set is super cute!! What a fun way to send a dose of care to someone who needs a pick me up! The tissue box idea is really cool! The tissue box die is fantastic!!! LOVE! These products are gorgeous! And the samples are so beautiful, your team is so talented! Oh the bed is fantastic – what a great idea! Such cute sets! Love the tissue holder. I love all of the peaks today, these are great! This cozy bed ensemble is adorable. And the mini tissue box die is so clever! The Cozy Bed is just so…COZY! Thanks to all for sharing their creativity and for all the inspiration this creativity inspires. Adorable ideas and I love the new products! Super sweet products! That little tissue box is adorable!! I love the headline on the newspaper! That is so cute and clever. I have a lot of mom friends that would appreciate that. Such clever and cute products…I simply cannot wait to get my hands on them!! I wasn’t planning to order this month, but I don’t know if I can wait to buy these adorable get well products. What a thoughtful set of dies and stamps…and what a great way to cheer someone who is feeling ill!! Fantastic! You girls keep coming up with such clever ideas! Love the new products! Great projects in the group post. I make a lot of get well cards. These sets look like fun to create with! What an innovative way to deliver get well wishes to someone — young or old! These are the cleverest stamps and die sets ever! The design team are so clever with their projects. What a fun collection today…all sorts of goodies! So many great products. The cozy bed die is so clever! The Tissue Box cover is unique. Great ideas! I love the Cozy Bed dies and the tissue box! Genius! Wonderful projects! Really cute Kleenex holder! There are some amazing products shown today! I’m worse than horrible about sending get well wishes. Maybe with these stamps and dies, I can get some things made ahead of time, and actually get them sent before the person is totally well again! Thanks for the chance to win a gift certificate. I just loved the cozy bed die.. Unique concept and wonderful outcome…Lovely!! I really need wedding products as I have two children who were just married and I am doing albums. So many great ideas to cheer up someone who is sick or in need of a good rest. The bedhead die could also double up as a fence, I think. These are all so great! The tissue box is an all time favorite and can be used in so many ways. Erin did a great job in her design and the DT showcased it all so beautifully! Love the pjs & bed die! So cute! I can see all of the super cute projects waiting to be made with that adorable tissue box. One of the best times to show extra love to friends is when they are under the weather. These are great products to share the love! What an adorable set. Love the PJs and bed details. Wow, some unique ideas for get well cards! How awesome! So many possibilities with these. I LOVE that cozy bed set too – so great for being sick, for Mother’s Day, Father’s Day and more! I was just thinking that I need to make some feel better cards and here you are with the best Stamp set for this. Thank you for all the inspiration! These are adorable! I love the idea of the new products. I can think of many things that can be done with these. Loving the Cozy Bed dies and Take It Easy set! I’m so happy to see the cozy bed and accessories. My mind is spinning. Thank you. The tissue box die is just great ! The tissue box is a marvelous idea! Love those useful gift ideas! What cute get well ideas! These new products are so cute – will be easy to make thoughtful and pretty get well cards! The brilliance of Erin is scary! Must be all that hard cider. LOL Seriously, I love today’s s ets and will be purchasing them on the 15th. Heaven help me! OMG! That newspaper is too cute!! The newspaper headlines are so fun! Great projects from everyone! Great new range for cheering people up! Maile’s new splits look fantastic too. What great cards! These are certainly unique stamps and dies. Once again Papertrey has come up with a wonderful concept! What wonderful ideas the DT has come up with to showcase this versatile set of stamps and dies today! Love this release! Tissue box die is just adorable!! Looking forward to the release. This is such a unique set of products-PTI always thinks of everything. All of a sudden get well cards are fun! 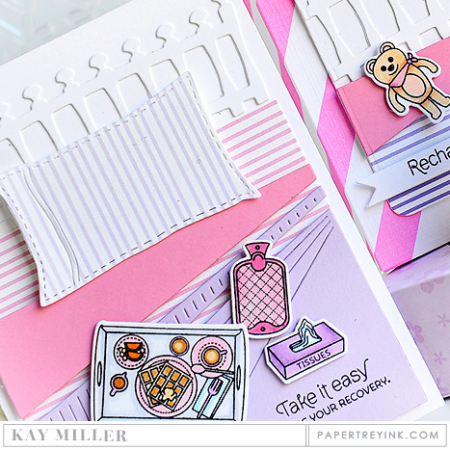 The tissue box die and the Cozy Bed die set are sheer Erin-geniusness!!! How wonderful! What a great way to make someone feel better! I just love all your unique ideas for stamps and dies! I am fairly new to card making but am getting into it more each day! I love the new PJ stamps! So cute! Wonderful projects! Would love to get something made from this set if I wasn’t well! So uplifting! Delightful!!! I can’t wait to make up some get well baskets-these products are great! All of these are just adorable!! Love the bed! Love the releases today. It’s a fresh new look for those Get Well Cards that I seem to need a lot lately. The tissue box die is TOO cute!! Love it!! What great products for the perfect care package! OMG, I want it all. The products in this release are amazing. I love the swans and the “get well” die and stamp items. So creative. Great new products and fantastic projects! What a well thought-out concept! Love all the cute projects from the team. Nichole’s quilt is adorable. What a great supplies to make get well cards! Such a cute idea the tissue bix. Perfect for the get well soon theme. What beautiful and thoughtful projects! Oooh!! The tissue box, quilt , and a hot water bottle. It’s all too cute. Thank you for the inspiration. The Jammie’s are so cute! What a great idea! Those newspaper headlines are adorable! How clever! Thanks for the inspiration. Love the tissue box cover. What an awesome set for getting well…needed in so many ways these days! Thank you PTI! Wow! PTI is really knocking out of the park with this release! Such innovative products this month! LOVE all of the get well products and gift ideas! Laurie’s ‘BLESS YOU’ on the tissue box is priceless! Your new “get well” collection really fills a gap for me….with flu season upon us. I especially like the bed die set…..so many cute possibilities from feminine to masculine. What a cute and creative day of reveals. What cute ideas for cards when someone isn’t feeling well! What a cute tissue box. And lovely projects. Super cute set! Great items!!! Today’s post is truly full of good things! I am loving all of this release & trying to figure out which products are the ones I absolutely have to have NOW!? PTI has the best stamps and dies by far!!! Such cute sets! I love the little tissue box!